Our NETGEAR R6220 review showcases a router that offers a networking solution that provides the best performance in terms of lag limitation, increased wireless range and optimized throughput for streaming or sharing may be a little loath to splurge $100 or more on a router. A fact that makes the NETGEAR R6220 an appealing device for those who are looking for maximum performance at less of a price. Our NETGEAR R6220 review will show you why this modem is at the top of its class. Despite all of the functionality and performance features offered by the R6220, its strongest point must lie in its value for money. There are almost no negative reports on the R6220, with most product reviews on either 5 or 4 stars, and for good reason. One of the most prominent strong points about this router regards its wi-fi range. Furthermore, the levels of control over the security and customizability of the home-network is another strong feature. With almost nothing to complain about, one needs to dig pretty deep to find negative reviews on the product. If criticism needs to be given, it is probably because of the absence of Beamforming which allows for greater range, speed, and stability when connecting to mobile devices. However, the sheer strength and range of the R6220’s wireless capabilities almost negate the lack of Beamforming on this device. While the R6220 may not hold a candle to some of NETGEAR’s more expensive routers, for the price, it is probably unbeatable in functionality, reliability, and speed. 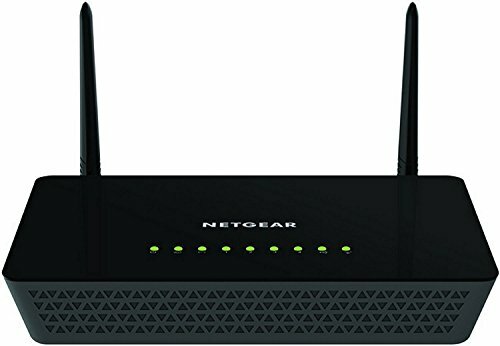 Personally, I would recommend this router for those who are on a bit of a budget but are still looking for something that can give you an edge in online play, 4k streaming and set up an easy to use a home network. The R6220 provides an all-around and functional networking solution that is a cut above your average router, making it great for those with high demands for bandwidth, multiple device connectivities as well as superior WiFi range and stability. Because of this, it is perfect for the average household that needs greater connectivity but is also ideal for casual gamers who are looking for a lag-free play or the ability to stream and share at up to 4k. Its superior wi-fi range also makes it ideal for large homes with plenty of wireless devices to connect to. This is because its dual-band system makes the device a great companion for mobile devices, PCs, Macs, laptops and current generation gaming platforms such as PS4s and Xbox Ones. Those with exceptionally high demands for bandwidth may find this product a little underwhelming, while those without the need for extensive wireless coverage may find most of the Wi-Fi features inconsequential. The devices compatibility with USB2.0 also makes it a little inferior when it comes to in-home sharing when compared to those with USB3.0. So, anyone looking to get the most out of file, printer and media sharing might want to look at something with USB3.0 compatibility, since it offers higher speeds with regards to data transfers. 802.11ac simultaneous Dual-Band Gigabit wireless. 300Mbps on 2.5GHz and 867Mbps on 5GHz allows for greater range, stability, and speed of wireless connections. 5x Ethernet ports: 1 WAN and 4 LAN with auto-sensing technology to connect a larger number of wired devices for optimal bandwidth allocation. USB 2.0 compatible to enable the file, media and printer sharing across the network. An 800MHz processor for optimized throughput and greater connectivity, speed and performance during bandwidth-heavy applications. The NETGEAR genie app makes managing and monitoring your connected devices simple and effective. Wi-Fi protected access with WPA/WPA3-PSK encryption keeps your wireless connections secure. Double firewall protection with SPI and NAT firewall features. Easy to set up, a web-based interface and management system. Friendly UI and Easy Installation. It takes longer to reset than other products. It has a lower signal strength than others. The NETGEAR R6220 comes complete with an onboard 880MHz processor which enables it to handle higher packages of data with ease. The resulting benefits to throughput make the device suitable for online play across multiple devices that is lag free and far more stable, as well as streaming videos and gameplay up to 4k. The device also comes with 128MB RAM to assist with this, ensuring that this router provides stability, superior performance, and unrivaled functionality when compared to routers in its price range. The R6220 sports a dual-band wireless system on 2.5GHz and 5GHz which makes it ideal for connecting multiple mobile devices, as well as current-gen gaming consoles, PCs, and Macs. This allows for greater stability and compatibility, as well as enabling the router to reach wireless speeds of 300Mbps on 2.5GHz and 867Mbps on 5Ghz channels. This makes the R6220 ideal for large homes with a multitude of connectable devices where proximity and wireless interference might be a problem. The R6220 makes use of advanced QoS services to ensure that each and every one of your devices can benefit from optimized and streamlined bandwidth allocation. This helps to minimize the negative impact of high bandwidth demands from multiple devices. It allows you to prioritize certain devices which are more likely to chew up your bandwidth such as those that are streaming, buffering or being used for online play; giving you full control over your network traffic with ease. The Asus RT-ACRH13 Router box comes packed with a small documentation flier, an installation guide, a CD with the drivers, a wall power adapter, an Ethernet cable, a special VIP warranty that offers some extended benefits and of course the router itself. The NETGEAR R6220 provides an all-around set of functions, performance benefits, and services which make it a good buy almost regardless of your needs. It is a fine compromise between price and ability which seeks to meet the needs of layman network users, as well as those that are looking to get the most out of the device’s performance for the price. The top strength of this router is its utter value for money; showing that you don’t always have to spend more to get more. I hope you liked our NETGEAR R6220 review.